Context: Chronic periodontitis is multifactorial disease with high prevalence rate in India. Motivation in periodontitis patients is thought to play a major role in influencing periodontal health in this patient. This online study focuses on different areas for motivation such as age, financial, and educational status including different health-care professionals. Aims: The purpose of this study was to evaluate awareness, behavior, and motivation regarding periodontal disease in general population and health professionals (dental and medical) in Maharashtra state with aim and objectives to assess the patient's knowledge and concern about the importance of self-care in controlling periodontal disease. Settings, Design, Subjects, and Methods: The study sample consisted of 1001 participants ranging between 20 and 60 years old. The questionnaire was prepared and circulated by the mobile application (WhatsApp). A questionnaire consisting of multiple choice questions was used as assessment tool and its content evaluated the patients profile, their knowledge about periodontal disease, the dental professional's commitment to instruct the patients toward their behavior concerning oral hygiene along with their perception of the importance of self-care for disease control and knowledge and motivation in dental and medical professionals about periodontal health. Statistical Analysis Used: The completed questionnaires were then analyzed statistically on survey monkey website to obtain the results through tables and graphs of the frequency distribution. Results: The result of this study shows basic awareness about oral hygiene in educated population but an acute lack of oral hygiene awareness and limited knowledge of oral hygiene in general population. Conclusions: Hence, there is an urgent need for comprehensive educational programs to promote good oral health and impart education about the correct oral hygiene practices. There is need for awareness not only in the general population but also in health-care professionals too. Periodontal diseases, comprising gingivitis and periodontitis, are probably the most common disease of humankind (Guinness World Records 2001). India is the sixth biggest country by area and the second most populous country in the world with high prevalence rate of periodontitis. Factors which contribute to the steady rise in the prevalence of periodontal disease include poor oral health awareness. Health is a universal human need for all strata of society. General health cannot be maintained without good oral health. The mouth is regarded as the gateway to the body and acts as a mirror that reflects the status of general health. Oral health plays an important role to maintain the overall health. There is evidence that oral health depends on social, biological, and environmental factors. Periodontal diseases have been linked to systemic diseases, and similarly, systemic diseases can also have an impact on oral health. There is a bidirectional relationship that exists between the two. Gingivitis and periodontitis comprise the two major inflammatory diseases which affect the periodontium. The onset and progression of periodontal disease involve a number of immunopathological and inflammatory features including local, systemic, environmental, and genetic modifying factors. The treatment of periodontal disease includes elimination of the etiologic factors, keeping the oral cavity free of bacteria by means of patient's plaque control and recurring dental prophylaxis programs, as well as promoting host defense through good physical health. In periodontics, it is also acknowledged that the patient himself/herself is usually more capable of controlling his/her health-related changes and lifestyle than the dental professional. To do so, he/she must be motivated. According to the definition given by Dr. Richard Ryan, motivation is the energy that directs our behavior. Motivation acts as a driving force in the prevention working as an inducing factor. Clinically, it means getting the patient's cooperation to lead him/her in the desired direction, that is, a change in his behavior. In this case, the communication between patient/dental practitioner is of crucial importance for a successful treatment. Dental professionals should induce the patient's attitudes toward obtaining periodontal health. Knowledge of oral health is considered to be an essential prerequisite for health-related behavior. Budding health professionals belong to the strata of society considered to have a better knowledge and awareness than the general population, but assessment of actual status demands a proper channeled study. According to the literature, no online study has been done to assess the oral hygiene awareness in Maharashtra till now; this survey was, therefore, initiated with a prime focus to determine the oral health awareness levels among the general population and health professional in Maharashtra state. The purpose of this study was to evaluate awareness, behavior, and motivation regarding periodontal disease in general population and health professionals (dental and medical) in Maharashtra with aforementioned aim and objectives. To assess the medical professional's knowledge about relation between periodontal and systemic health. The study sample consisted of 1001 participants (Male – 420 and Female – 581) ranging between 20 and 60 years old. A self-constructed questionnaire consisting of multiple choice questions was prepared on survey monkey website and circulated by WhatsApp. The questionnaire included information related to the patient's name, age, gender, occupation, residential area, and their knowledge about periodontal disease. The questions were concerned about dental professional's commitment to instruct the patients toward their behavior concerning oral hygiene along with their perception of the importance of self-care for disease control and knowledge and motivation in dental and medical professionals about periodontal health. The completed questionnaires were then analyzed statistically on survey monkey website to obtain the results through tables and graphs of frequency distribution. The data from 1001 questionnaires comprised 42% males and 58% female volunteers, mean age of 28.4 years old, ranging between 20 and 60 years. As far as socioeconomic level is considered, most participants in the sample (36.7%) reported a monthly income of >5 lakh, while 15.5% were 3 lakhs–5 lakhs, 24.13% were found to be in the range between 1 lakh to 3 lakhs, and 23.7% were below 1 lakh. 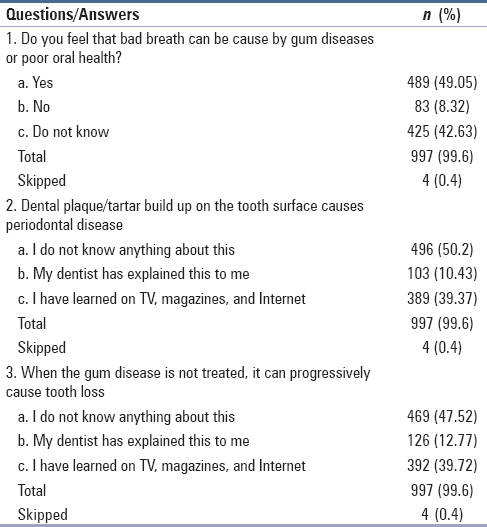 Patient's behavior concerning oral hygiene was assessed through the questionnaire responses. Motivated patient behavior has the most important role in prevention as well as for successful treatment outcome of periodontal disease, as we know periodontal disease that is highly prevalent in the Indian population. As per the WHO 2003 report, the prevalence of periodontitis is 86% in India as well as many research studies have proved association between periodontitis and systemic diseases such as diabetes mellitus, preterm low birth weight, and cardiovascular diseases. And finally lack of motivation for desired behavior of the patient for the maintenance of treatment of periodontal diseases. The most effective method among prevention measures is the one which considers the patients' active self-care to manage their own health and promote habit changes. For this reason, a questionnaire was applied to evaluate the responsiveness of the patient's self-care education and oral hygiene behavior. Although brushing was commonly used method of cleaning teeth, it was found that only 29.6% participants reported cleaning their teeth twice daily [Table 1] which is very less as compared with 58% of the Police recruits in a study by Dilip, 67% of the Chinese urban adolescents in a study by Jiang et al., 62% of the Kuwaiti adults in a study by Al-Shammari et al., and 50% of the middle-aged and 75% of the elderly Chinese adults in urban areas in a study by Zhu et al. According to Seyerskov, more important than frequency is the hygiene quality. Rylander and Lindhe emphasize that to generate appropriate oral habits, the patient's willingness, and ability to clean his/her teeth properly is more important than the selection of a specific brushing method. This study shows most of the population uses circular or random motion for brushing their teeth [Table 1]. Regarding hygiene products, only 4% of the participants were using floss and interdental brush [Table 1]. In contrast, Hamilton and Coulby in 1991 found that a high percentage (44%) of the sample in Northeastern Ontario used dental floss. The reason for this may be educational program that is carried out in Canada which lacks in our society. This emphasizes the urgent need for educating and motivating the public to use this efficient method for oral health care. The study showed that 84% of individuals had developed the proper habit of cleaning tongue [Table 1] and 71% rinse their mouth after meal in their daily routine [Table 1]. This shows basic awareness about oral hygiene in educated population. About 25% participants use mouthwash solution and 67% did not use mouthwash even 7% individuals not even known about mouthwash [Table 1]. Essential information such as biofilm accumulation on the tooth surface as the cause of periodontal disease, combining biofilm control with proper oral hygiene and tooth loss as a result of untreated periodontal disease, was considered of pristine importance for a under treatment patient. In the questionnaire, 50% participants were unaware about the information that biofilm, plaque on tooth surface causes periodontal disease [Table 2]. Nearly 40% were known that gum disease can progressively cause tooth loss through magazines, Internet, and only few were informed by their dentist. This shows the need of dental professionals commitment to instruct their patients [Table 2]. As perception of self-care is concerned, a result showed that only 7% individuals visit regularly to the dentist, 93% visited whenever there is a problem. 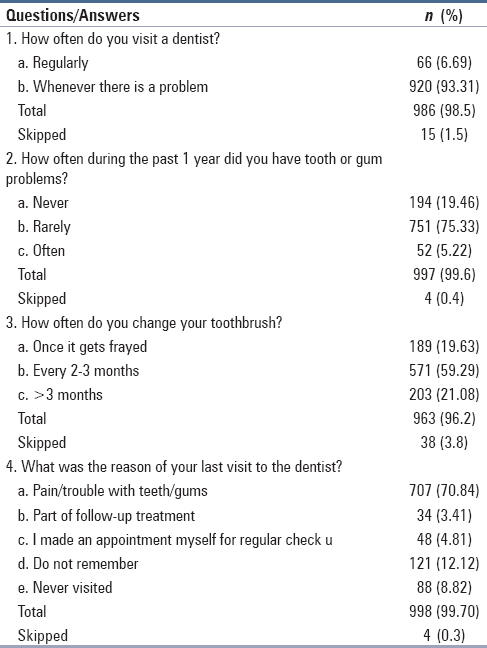 When asked for the reason of last visit to the dentist, 70% replied pain/trouble with teeth and gums [Table 3]. 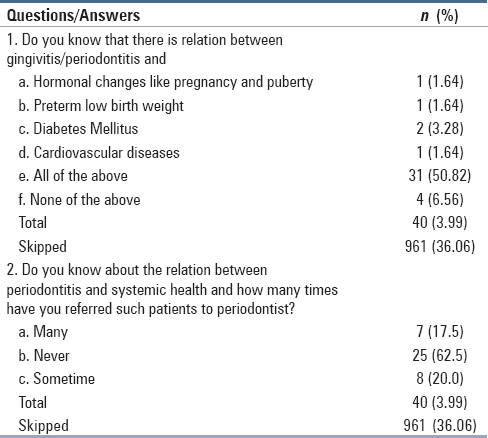 While evaluating the knowledge in medical and dental professionals about the relationship between systemic diseases and periodontal health, very few are known about the relation of systemic condition such as cardiovascular diseases, preterm low birth weight, and diabetes mellitus with periodontitis [Table 4]. Many health-care professionals never referred such patients to periodontist [Table 4]. So as per the result of the survey, there is a need to take steps to create awareness among general population toward oral hygiene and motivate them to improve their behavior for the prevention and maintenance of periodontal disease. As well as need to encourage health-care professionals too to provide proper information and motivation to their patients toward the most prevalent disease like periodontitis. Status of oral hygiene is very poor in the Maharashtrian population. From the result, we conclude that there is need for comprehensive educational program and public health awareness through TV, radio, press, Internet, and other social activities like motivating school teachers as they convey it to their students and ultimately to their parents. There is need of awareness not only in the general population but also in health-care professionals too. Disney JA, Graves RC, Stamm JW, Bohannan HM, Abernathy JR, Zack DD, et al. The university of North Carolina caries risk assessment study: Further developments in caries risk prediction. Community Dent Oral Epidemiol 1992;20:64-75. Haumschild MS, Haumschild RJ. The importance of oral health in long-term care. J Am Med Dir Assoc 2009;10:667-71. Deci EL, Ryan RM. The “what” and “why” of goal pursuits: Human needs and the self-determination of behaviour. Psychol Inq 2000;11:227-68. Jiang H, Petersen PE, Peng B, Tai B, Bian Z. Self-assessed dental health, oral health practices, and general health behaviors in Chinese urban adolescents. Acta Odontol Scand 2005;63:343-52. Al-Shammari KF, Al-Ansari JM, Al-Khabbaz AK, Dashti A, Honkala EJ. Self-reported oral hygiene habits and oral health problems of Kuwaiti adults. Med Princ Pract 2007;16:15-21. Zhu L, Petersen PE, Wang HY, Bian JY, Zhang BX. Oral health knowledge, attitudes and behaviour of adults in China. Int Dent J 2005;55:231-41. Rylander H, Lindhe J. Terapia periodontal associada à causa. In: Lindhe J. Tratado de periodontiaclínica e implantologia oral. 6th ed. Rio de Janeiro: Guanabara Koogan; 1999. p. 314-31. Hamilton ME, Coulby WM. Oral health knowledge and habits of senior elementary school students. J Public Health Dent 1991;51:212-9.